Last week the VIX traded at the lowest level since November, but the VIX:VXV ratio dropped to 0.78. Readings below 0.80 are extremely rare. The VIX reflects anticipated volatility over the 30 days. The VXV reflects anticipated volatility over the next three months. The expectation of increased mid-term volatility (VXV) relative to short-term volatility (VIX) is usually a contrarian indicator. In other words, when investors expect short-term volatility to remain subdued, the market delivers the opposite. The chart below plots the S&P 500 against the VIX:VXV ratio. As the dotted blue lines show, low VIX:VXV ratio levels tend to spell trouble for stocks. The only unusual development is that the CBOE Equity put/call ratio is relatively elevated. A rising CBOE Equity put/call ratio tends to coincide with lows. 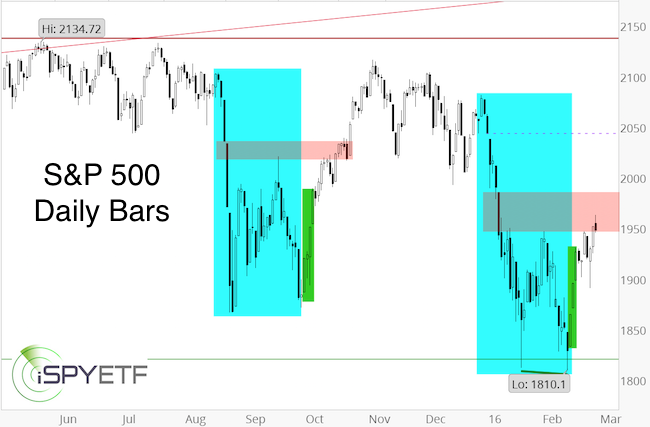 The S&P 500 reached an obvious resistance zone last week. The VIX:VXV ratio suggests lower prices. It makes sense to expect further weakness. The elevated put/call ratio may soften the effect of the VIX signal or cause any pullback to become more choppy. 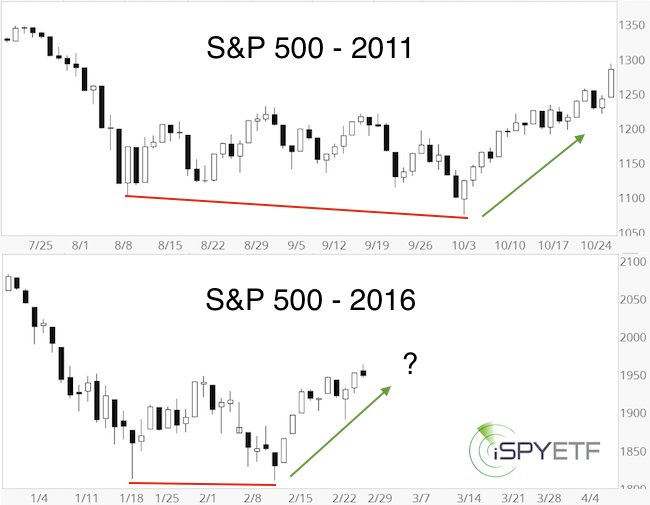 S&P 500 at Inflection Point – What’s Next? Throughout January and February (but especially since going long on February 11), the Profit Radar Report has been harping about the ‘need’ for the open chart gap at 2,043.62 to be closed. The gap was closed last Thursday. Will the S&P 500 push deeper into the resistance zone that starts at 2,040 (2,040 – 2,080), or will it relapse, or both? About a month ago, we looked at a different kind of trading volume analysis (horizontal instead of vertical). The horizontal columns below show trading volume for the S&P 500 futures, based on price (horizontal) not day (vertical). 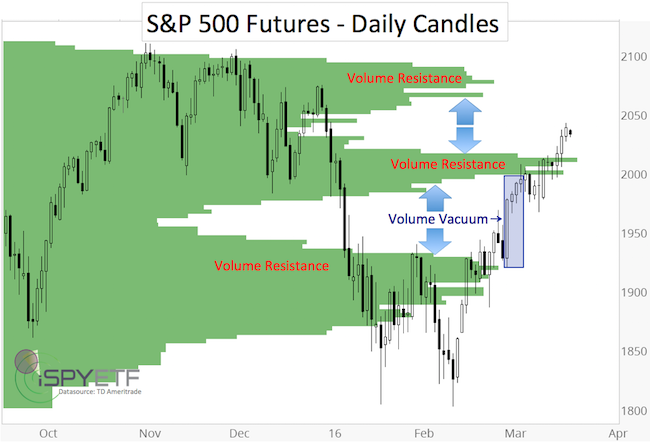 Last week, the S&P entered another volume vacuum, so slightly higher prices are possible before it hits the next volume spike resistance starting at 2,060 – 2,070. 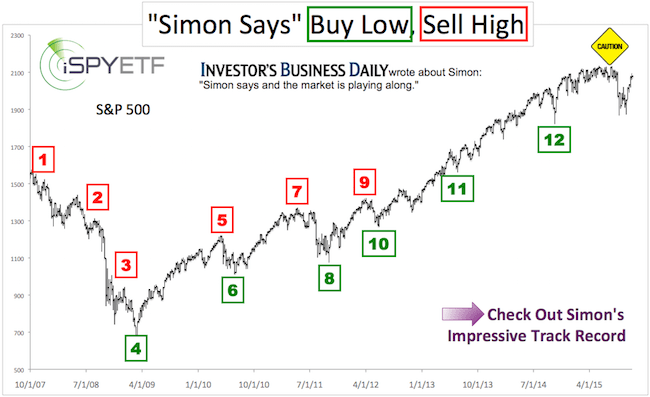 The chart below shows that the 2016 decline, double bottom and subsequent rally looks a lot like 2015, a parallel the Profit Radar Report has been pointing out since late January. The August 2015 mini meltdown left an open chart gap at 2,035.73, which we expected to get filled (just as the 2016 chart gap at 2,043.62). The 2015 gap was filled on October 20, the 2016 gap on March 17. 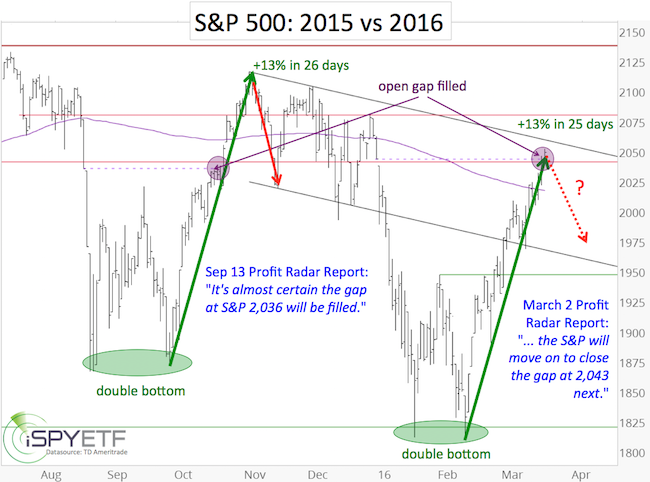 In 2016, the S&P 500 rallied after the January/February double bottom, in 2015 after the August/September double bottom. In 2015, the S&P rallied 13% in 26 days. As of Friday, the S&P rallied 13% in 25 days. In 2015 the S&P was 50 points above the 200-day SMA when it ran out of gas. Right now its about 30 points above the 200-day SMA. If the parallel continues, this rally is ready for a breather. 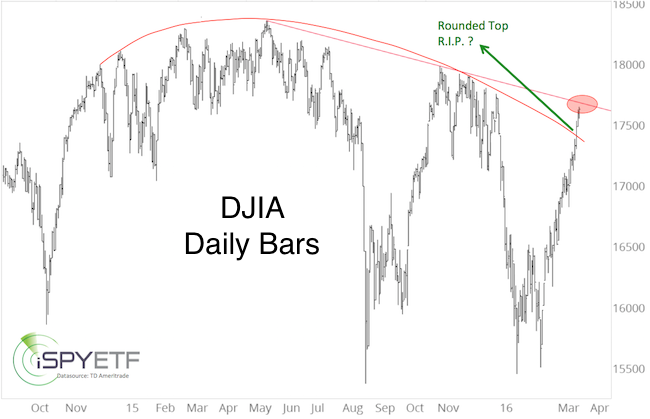 Following the 2015 August/September double bottom, the Profit Radar Report did a detailed liquidity analysis to assess the strength of the rally (free version of this study is available here: Is the Stock Market Running out of Buyers?). An updated version of this liquidity analysis (analyzing the rally from the February 2016 low), was published in the March 20, 2016 Profit Radar Report. The conclusion? Market breadth (or liquidity) behind the rally off the September 29, 2015 low was the weakest in years and did not inspire confidence in sustainable gains. The early 2016 relapse was therefore no surprise. Indicators aside, down side risk today is obviously greater than it was at S&P 1,810. Chasing stocks after an 11% rally while approaching the upper end of an 18-month trading range doesn’t sound like a bright idea. So, further up side is possible, but the risk/reward ratio is not attractive, because the odds of a pullback are elevated. Nevertheless, a fair amount of indicators suggest that any pullback will only be temporary. How temporary? Fortunately we don’t have to pinpoint the scope of an upcoming correction at this very moment. The market will likely provide enough tell-tale signs to either discern the down side target or the next likely turnaround. 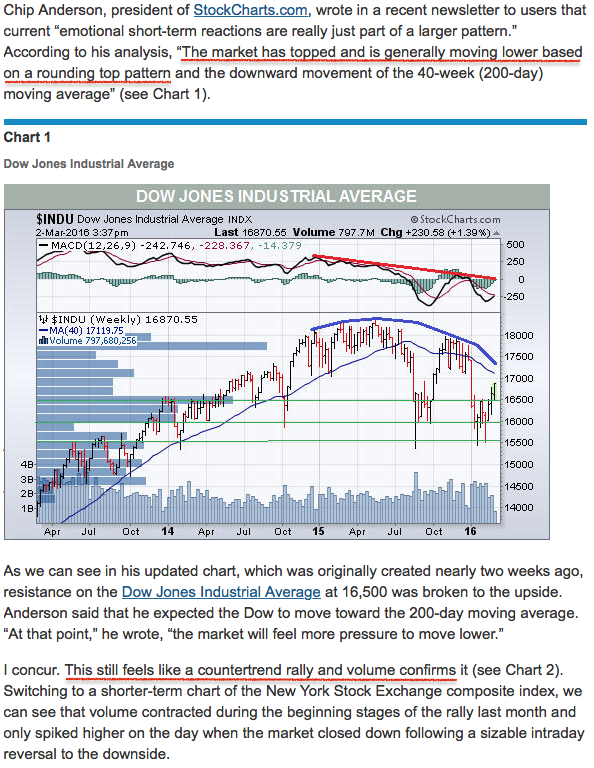 Continued analysis is available via the Profit Radar Report. 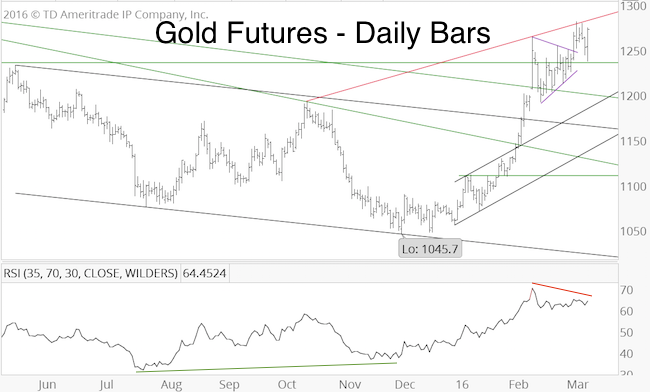 Gold and Silver Rally Stalled – What’s Next? 2016 has seen a renaissance for gold and silver. But just as the luster started to return (and investors piled back into the GLD ETF), the rally stalled. The chart below shows the triangle (purple lines) and other resistance levels followed by the Profit Radar Report. There is also a bearish RSI divergence at the latest high. This explains why gold has fallen since its 1,290 spike high. A deeper correction, likely followed by another rally leg is likely. Correction low and rally high targets are available via the Profit Radar Report. 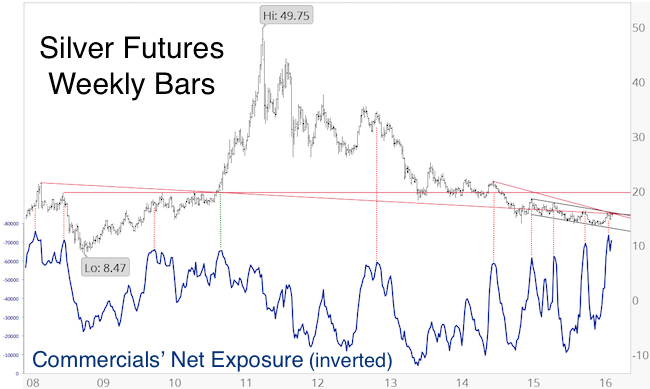 The long-term silver chart (initially published in the February 21 Profit Radar Report) explains why silver is struggling to move higher. 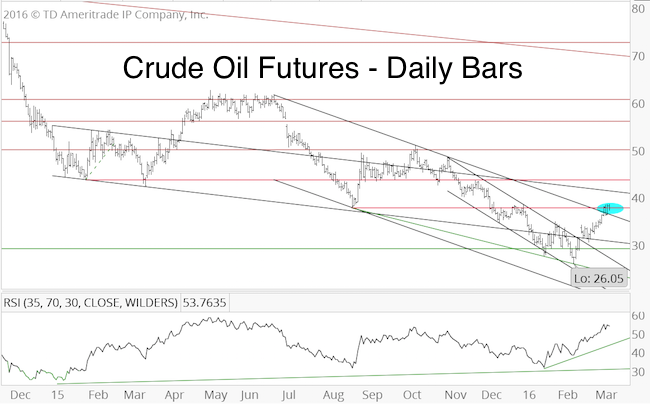 Various technical resistance levels converge around 15.7 – 16. Commercial hedgers are record bearish. Commercial hedgers (the smart money) have the highest short exposure since 2008. History (in particular recent history) says this is bad news for silver. The only time commercial hedgers were wrong was late 2010 when silver entered its blow-off stage. While we anticipate more gains for silver later in 2016, sentiment and seasonality will make it very difficult for silver to rack up further gains in the near future. It would take a strong catalyst to drive gold/silver prices higher and void bearish sentiment and seasonality. The risk is to the down side for now. 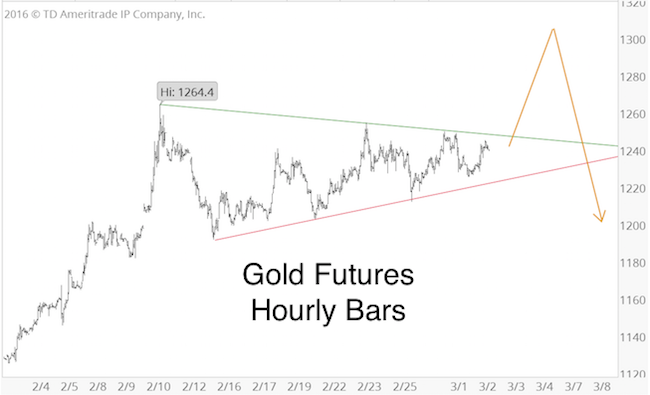 Continuous gold and silver analysis is available via the Profit Radar Report. Below is a complete excerpt of the S&P 500 analysis featured in the February 28 Profit Radar Report. This is a rare, and longer than usual re-print of s subscription-based report, but I believe you’ll find it interesting and worth your time. To put this update into context, allow me to highlight some of the comments leading up to the February 28 Profit Radar Report. The February 11 Profit Radar Report listed six reasons why the S&P is expected to rally and recommended to buy at 1,828. The last observation builds a nice bride to the February 28 Profit Radar Report. Enjoy. Since February 17, when the S&P 500 first spiked to 1,930.68, we’ve been watching how the S&P reacts to its overbought condition. It’s been a topsy-turvy eight trading days since, but the S&P gained an additional 18 points. This is a positive development for stocks thus far. There hasn’t been much net-movements and little new information the past week, so we’ll use the time to review and perhaps clarify our outlook and analysis. The chart below shows both projections along with some additional information. On February 11, the S&P 500 dropped to 1,810.10, which was 2.19 points below the January 20 low (1,812.29). This new low activated both projections. Although the S&P did not drop as low as the dashed yellow line shows (projection #3), it triggered the minimum requirement for projection #3 (“immediate drop to new lows”). Projection #2 (solid yellow line) was validated as well. The blue lines outline a W or double bottom formation. The projected up side target of a valid W formation is somewhere in the 2,060 – 2,100 range. What would validate the W formation? Depending on which criterions are used, the W formation is validated with a break above the February 1 high at 1,947.20 or the January 7 high at 1,985. As a point of reference, the last W formation was carved out in August – October 2015 (blue box). The red bar highlights the W resistance zone(s), the green bar the post-bottom kickoff(s). 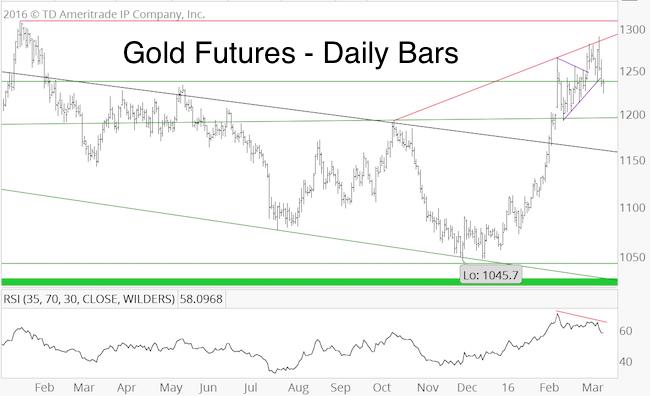 A detailed analysis of the February kickoff rally (three consecutive daily gains of 1.5%+) was published in the February 21 PRR. 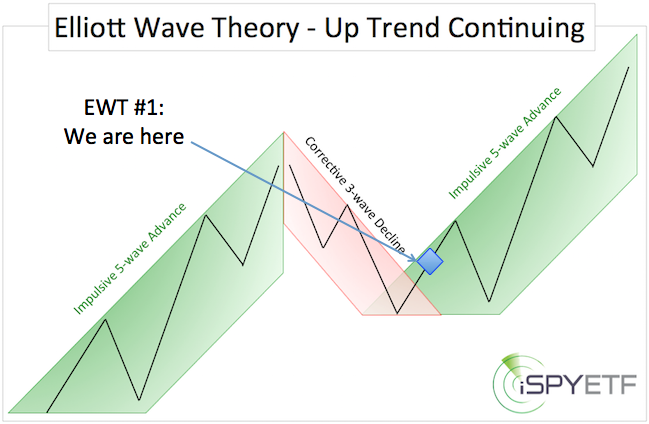 If you are a new subscriber, take a moment to review the significance of this pattern. The February 7 PRR re-visited a comparison between 2011 and 2016. In 2011, the S&P broke its initial August low on October 4 against various bullish divergences. In 2016, the S&P broke its initial January low on February 11, also against various bullish divergences. However, there were only 16 days between the January 20 and February 11, 2016 lows. In 2011, the S&P 500 chopped around for 40 days until finally carving out a lasting bottom on October 4. In terms of price and divergences, the S&P already fulfilled the minimum requirement. In terms of time, it could take until March or April until we see a more lasting low. 1) The S&P 500 completed a larger-scale wave 4 correction on February 11, which is to be followed by further gains and ideally new highs (dashed yellow projection #3). The conceptual chart below marks where we’re at right now, assuming this scenario is playing out. 2) The S&P 500 completed the fourth wave of a larger wave 4 correction on February 11, and needs another new low to complete the larger wave 4 correction. The final correction low would be followed by further gains and ideally new highs. (solid yellow projection #2 and conceptual chart below). 3) The S&P 500 completed wave 1 of a new bear market on February 11. The current rally is a counter trend move. Once complete, this rally would roll over into a steep decline (this scenario is unlikely, see conceptual chart below). The obvious conundrum is to discern whether the S&P is more likely to follow projection #2 or projection #3. As per the February 12 PRR: “If the S&P is going to turn lower, it should do so between 1,945 – 1,990.” The S&P entered this general turnaround zone last week. We cashed in half of our position for a 5.2% gain. We are holding the second half in case a ‘runaway rally’ develops. More often than not, the onset of a runaway rally is unpredictable. It is not prudent to bet on the unpredictable, however, based on what we see, the environment for a runaway rally is in place. At this point, we feel comfortable holding on to our remaining half long position, but we are not confident enough to deploy new capital. Summary: The S&P is in the 1,945 – 1,990 region where a reversal is becoming more likely. However, the recent price action increases the odds that an upcoming reversal may only be temporary and shallow. Immediate support is at 1,947, followed by 1,915. A move above 1,990 would unlock higher targets (2,040 – 2,100). A move below 1,915 would be a first step towards lower targets. Since February 28, another price pattern emerged. This new pattern emphasizes the importance of the S&P 1,990 zone. 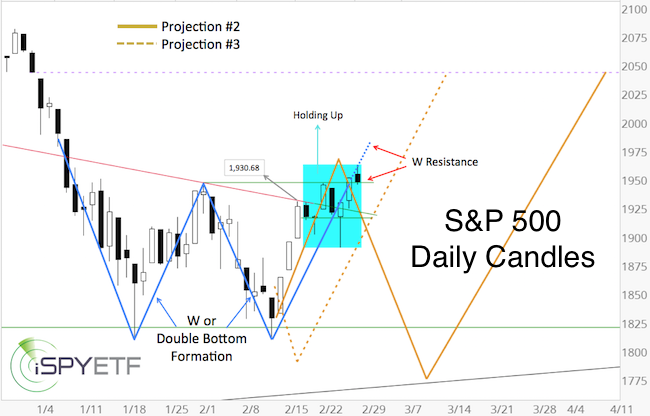 All the details about this new price pattern and how it affects the S&P 500 outlook are discussed in the March 2 Profit Radar Report. 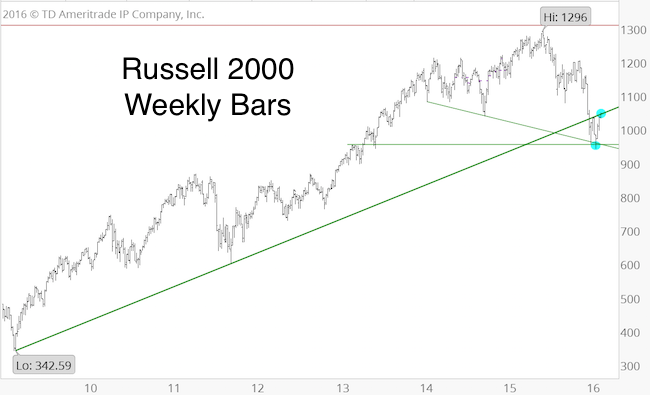 Russell 2000 and Transports at Crossroads? The Russell 2000 (RUT) and Dow Jones Transportation Average (DJT) racked up some pretty significant losses since their 2015 all-time highs. From the 2015 peak to the 2016 trough, the RUT lost as much as 27.23%, DJT as much as 31.22%. The S&P 500 lost ‘only’ 15.20%. It was the prevailing opinion for much of 2015 and early 2016 that the RUT and DJT would lead U.S. stocks into the next bear market. It is correct that small cap underperformance is one of the stages of an aging bull market, and in line with our analysis (view 3 Stages of a ‘Dying’ Bull Market). However, the timing for an immediate bear market didn’t seem right. The February 11 Profit Radar Report listed six reasons why stocks are likely to rally. 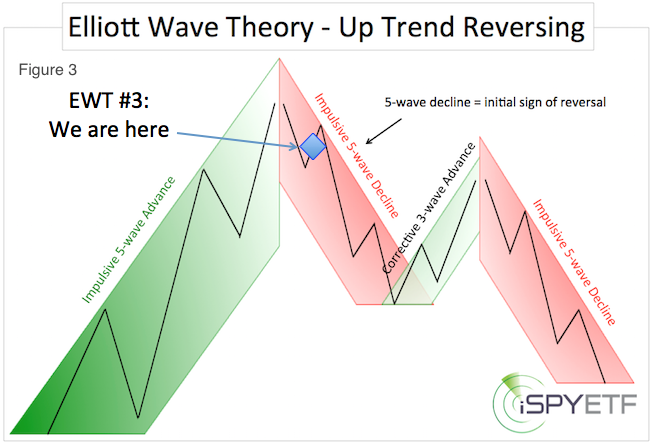 The ‘six reason buy signal’ is also discussed here. After almost three weeks of rising prices (RUT up 11%, DJT up 17%), the RUT and DJT have arrived at their first inflection point. The RUT is back-testing the ascending green trend line (currently at 1,045), which originates at the March 2009 low. Sustained trade above this trend line is bullish until the signal is reversed. 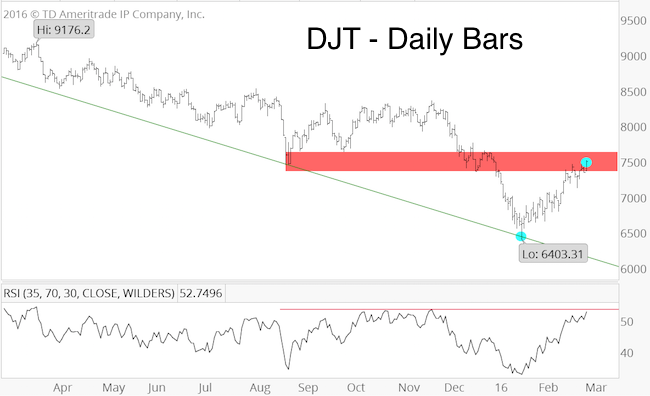 The DJT is threatening to break above the 7,400 – 7,500 zone. This zone served as support a few months ago. This is not only price resistance for DJT, it’s also momentum resistance as DJT’s prior rallies failed at similar RSI readings. 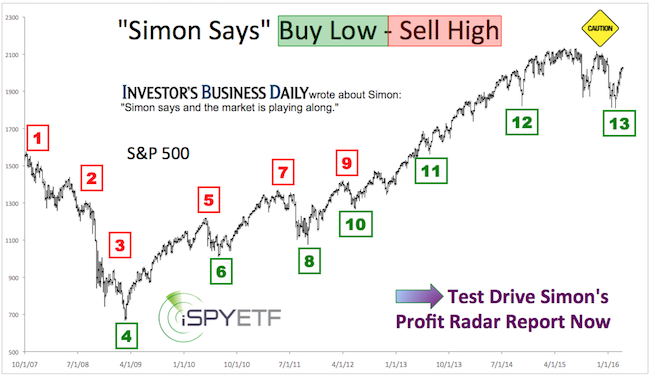 When the Profit Radar Report issued a buy signal at S&P 1,828, it wasn’t clear whether this rally would only move to the initial up side target at 1,950 or beyond. Based on investor sentiment, there was a distinct chance that a runaway rally (with higher targets) would develop. The S&P is not in the clear yet, but the RUT and DJT charts may help gauge the broad market’s prospects. RUT and DJT above their respective resistance levels is a positive for the S&P and other indexes.